Fresh flavorful salads are always in season! While at a local grocery store, Byerly’s, last month with the girls and they had a bunch of samples out featuring fresh healthy foods. The girls grabbed one with blueberries as I was grabbing blueberries. The berries have been looking amazing and over the past few weeks they were on sale so we were stocking up and enjoying them while we could. I thought the sample they had was spinach and blueberries but it turned out to be a few fresh mint leaves with blueberries drizzled with honey. One of the girls told me I had to try it. It was delicious, fresh, and simple. I grabbed some fresh mint thinking maybe the girls could put this with oatmeal or yogurt. The next day while trying to figure out what to make to dinner I opened the fridge and saw the blueberries and that delicious sample came to mind and inspired me to make this salad. 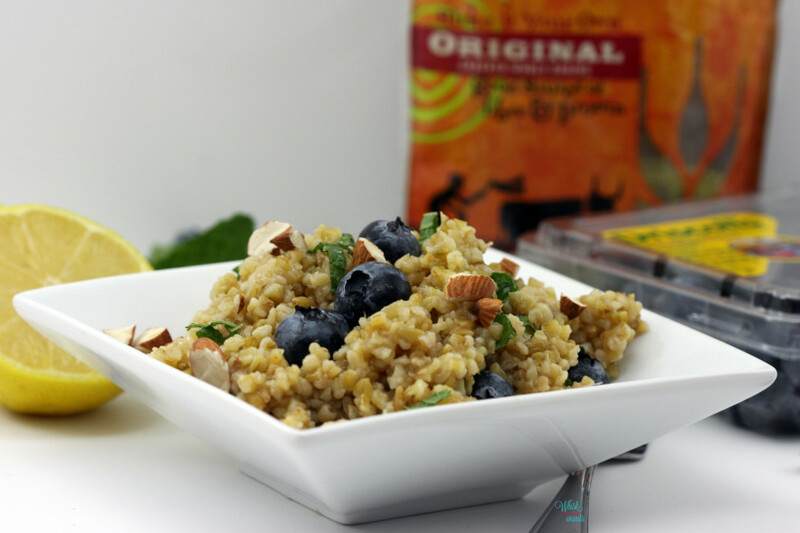 Along the lines of what I had thought with it being good with oatmeal I grabbed freekeh as it was a very filling grain that is filled with protein and would make a great base for this salad. I use the term salad loosely as this not only makes a great salad/side dish but also works as a delicious breakfast bowl/porridge! 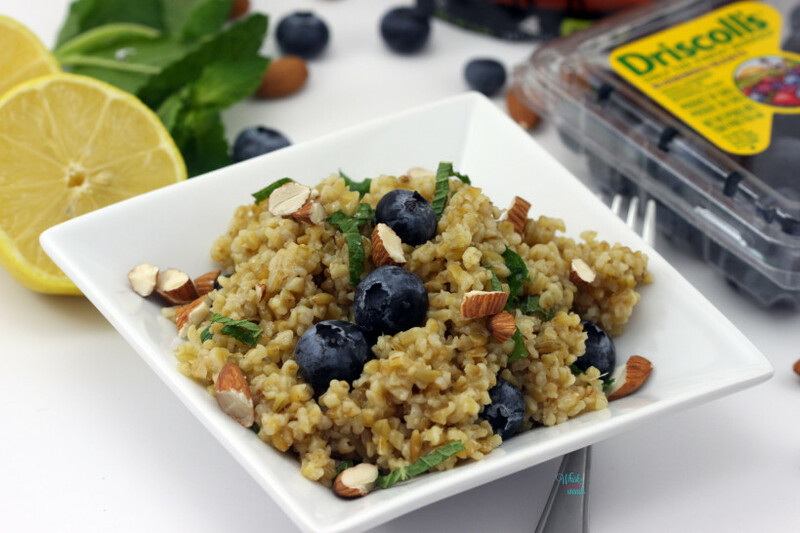 If you are trying to get your kids to eat a new grain this would be a great dish to try freekeh as it has the blueberries which many kids love! 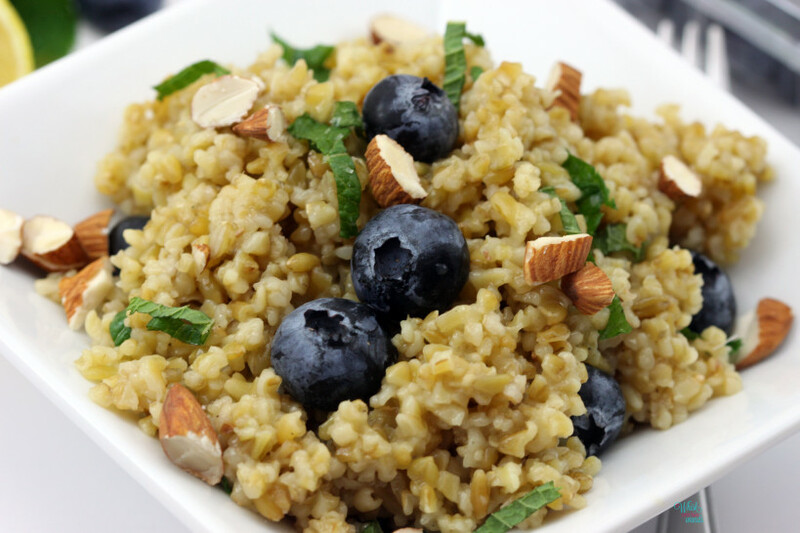 Freekeh is a great source of protein and fiber and is cooked just like rice. It is NOT gluten-free however, which is why we don’t enjoy it too often, but you can easily swap freekeh for quinoa in making this salad, both options are delicious but if you can handle gluten and are looking for a plant based protein option freekeh is a great option. I buy it at my local Byerly’s as well as Whole Foods Market. It’s Monday, Meatless Monday, once again and my co host Deborah and I would love for you to join us! Share with us what you’re enjoying this Meatless Monday. Link up and or find other great meatless recipes below. 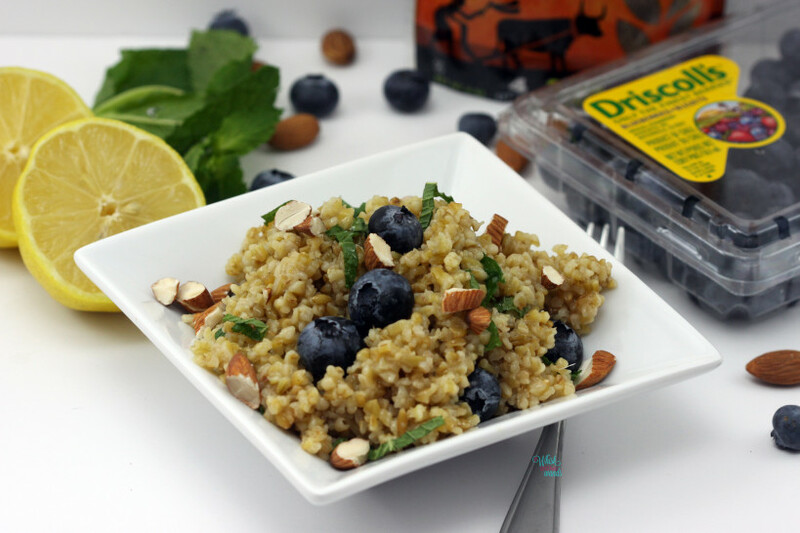 *To keep this more versatile if you are wanting to enjoy it over a few days, hot and or cold, for breakfast, lunch, and or dinner cook freekeh and add the dressing but don’t add the mint, blueberries, and almonds until just before serving. This allows it to be heated up without the mint, blueberries, and nuts getting soggy. Cook freekeh according to packaged instructions. Remove lid after cooking and allow to cool for 10 minutes. In a small bowl or glass jar, whisk or shake honey, lemon, and oil together. 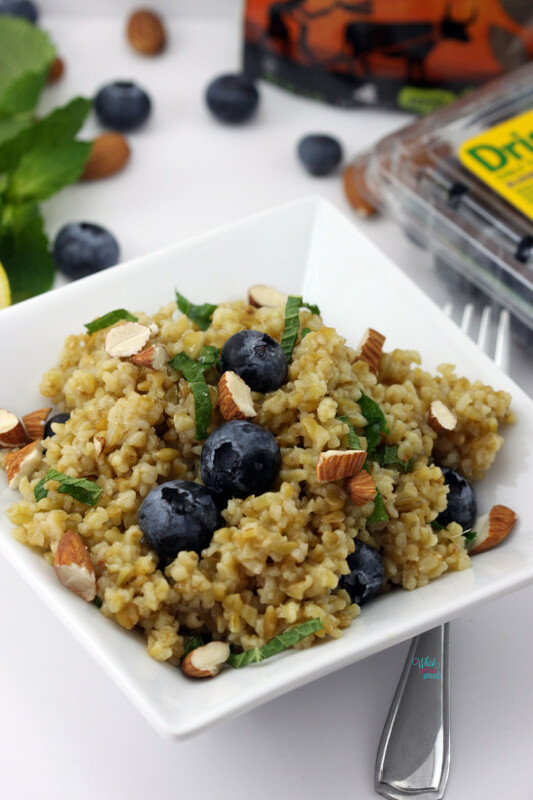 Fluff freekeh and place in a large bowl and toss with lemon honey mixture. Remove mint leaves from the steam and roll together, using a sharp knife or kitchen scissors thinly slice mint leaves. Add to the freekeh along with blueberries. This salad can be served warm or cold, if not eating right away store in the refrigerator. Top with almonds just before serving so they stay crunchy. Enjoy! Sharing and spreading the veggie love I’m also linking up with Annmarie for Meatless Monday! I love Freekeh! What a tasty looking recipe. Thanks for sharing it! Mmmmmmm! Blueberry and mint if one of my favorite flavor combos!!! Wonderful pairing in a grain salad! Thank you it is a combo I will definitely be enjoying a lot more of this summer! 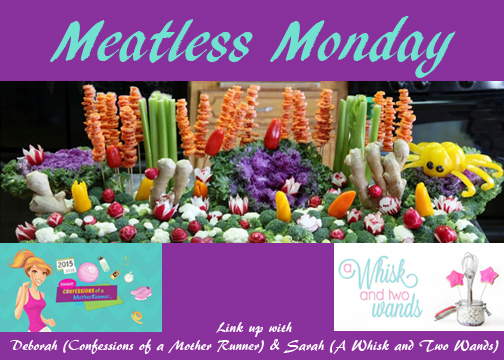 Thank you for linking up for Meatless Monday! Right there with you, if only it were gluten free I might! Yum! This sounds delicious and s great way to break out of a breakfast rut! Pinned for later! Thank you! Yes breakfast, lunch, or dinner it just works! oooo yum! I would definitely try this with quinoa – or even rice! Thank you! Yes quinoa is delicious with it! I just LOVE the combo of blueberry and mint in there, looks amazing! Thank you Annmarie, and thank you for linking up with us! 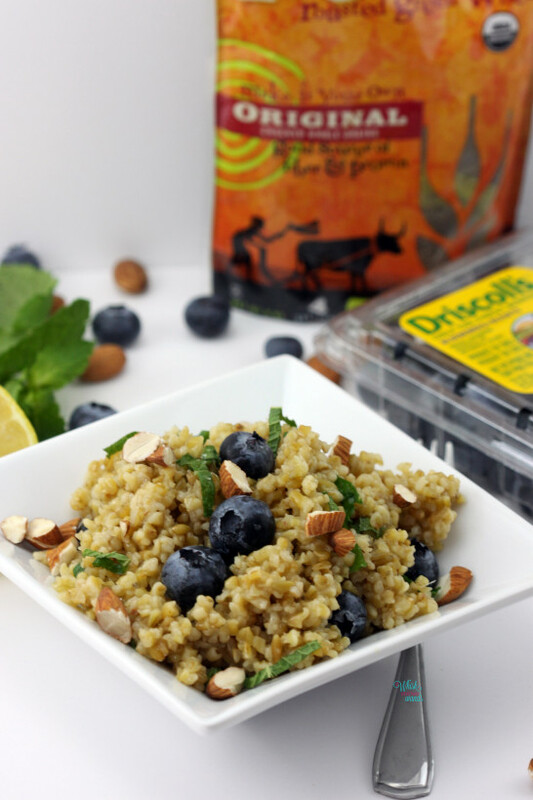 Oh Yum, what a fun combo…I never think to add blueberries to my freekeh but I totally want to try this combo..I am sure the mint gives it some flare! Thank you! I like to add fruits for fun to any grain or salad! Kind of random, but I have all this stuff in my pantry/fridge! Looking forward to trying it– such a unique combination. That is a little random…but then again so do I right now. Thank you I hope you enjoy it!